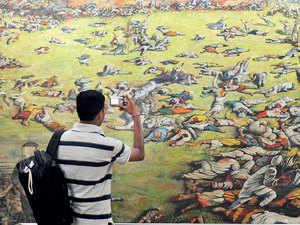 A painting depicting the Jallianwala Bagh massacre. This was more than a year after the Jallianwala Bagh massacre of April 13, 1919. In the immediate aftermath, Dyer had many defenders. British Indian officials felt obliged to support him as a matter of policy and few wanted to criticise an army officer. Rumours that the crowd was armed were used to justify the response. The British press was belligerent, raising fears of global rebellion that were much in the air in the years after the Great War. But then came the Hunter Commission of inquiry and Dyer’s own damning testimony. He admitted he could have dispersed the crowd without firing, but chose not to do so because “they would have come back and laughed”. He said he would have used machine guns to kill even more if he could have, and that he saw no reason to help the wounded. From within the army, views emerged showing long-standing doubts about Dyer’s temperament. The appalled Indian reaction made British officials aware of how much it could help the still struggling nationalist movement. British MPs condemned the massacre, from genuine shock or cynical calculation that blaming it all on Dyer would stem questions about the larger complicity of the British Raj. The petition, which is extensive, offers a fair idea of the paranoia pulsing in Dyer’s brain. And the link would be no surprise because, while Dyer was probably not a member of the Association, he shared deep roots with those in it. He came from the same community that set it up, around 36 years back, and the same passions that drove that event were still playing out all those years later in Amritsar. The event was the Ilbert Bill of 1883, which generally receives just passing mention in history books, but which had immense consequences for British rule in India. And the reasons for this lie even further back, in the two very different British responses to the Rising of 1857. The first was the relatively enlightened response that the British needed to invest more in India, and in Indians, to give them a stake in the Empire. This meant education and empowerment ultimately leading to the creation of an educated Indian middle class. The second was very opposite and was what unfolded on the ground in India. The Rising required revenge, and the British in India provided this in abundance, blowing opponents up with cannons, torturing and humiliating Indians and creating physical and social barriers to prevent Indians ever coming close to instruments of power again. If this response occasionally seemed excessive, the answer was what Dyer gave decades later: anything less would not be taken seriously by Indians. One community among the British in India was particularly supportive of this position. The "non-officials", as they were called, were British who had come to India on their own initiative, without the backing of the East India Company, and later the British government in India. The Company had been suspicious of unsanctioned foreigners in their domain and had kept the numbers of Europeans who were neither Company traders or soldiers down to as low as 2,000 by 1828. As the Company hold on India weakened and the attractions of making money here increased, the numbers of "non-officials" grew rapidly, to 46,000 in 1861, and 70,000 by 1871. They were a very varied bunch, ranging from wealthy merchants and lawyers in Calcutta and Bombay, to the European cooks and hairdressers who set up shop in these cities, to up-country planters leading a fairly rough life and British soldiers who had decided to stay on in India to make more money than they could hope to get back home. The British in India exploded at the proposal of the Ilbert Bill. Hirschmann titled his history of the event White Mutiny, and at times it seemed like this might really happen. But all non-officials shared one thing -they ranked below the official British in the all-important Warrant of Precedence that governed hierarchy in India. In large cities this might be relaxed a bit and clubs came up that allowed some rich traders to mingle with government officials, but "non-officials" were clearly seen as a lesser part of the Imperial project, in India to enrich themselves rather than serve the glory of the Raj. Predictably, this resulted in non-officials becoming over-zealous on their role in the Empire, and also on the one thing they felt defined them: superiority to Indians. Racism was intrinsic to the Raj, but among the upper echelons of British officialdom it was cloaked as paternalistic hopes for advancing some Indians someday. Among non-officials racism was open and unyielding: Europeans and Indians were different and it was risking disaster to threaten such natural order. Dyer's family had been in India for generations, originally in official roles, but also as "non-officials", as family members found different ways to survive in India. Dyer's father developed the first successful brewery in India, in Kasauli on the way to Simla. Dyer Meakin, as the company would come to be called, would start distilling as well, eventually producing Old Monk rum under the prudently renamed Mohan Meakin. This made the family well-off, but also made their social status unclear, especially once they made Simla their home. The summer capital of the Raj was a place where hierarchy ruled absolutely, and the beer-brewing Dyers ranked way down. Not surprisingly Dyer's mother wanted to change this, and putting her youngest son in the military was part of the plan. Perhaps to distance themselves from these Indian roots, Dyer was sent to school in Ireland. As Nigel Collett notes in his biography The Butcher of Amritsar, Ireland was in the midst of anti-British rebellion and this would reinforce Dyer's fears of imperial weakness. And later on, at officers' school at Sandhurst, he would have still felt an outside "both because of his Indian origins and because of his father's profession as a brewer." Dyer's Sandhurst years coincided with Lord Ripon's tenure as viceroy in India. Ripon was an unusual viceroy, the rare Catholic in a senior British official position at that time, very liberal and sympathetic to Indian interests. (He is still commemorated by the Ripon Buildings, where the Chennai Corporation sits). This made him anathema to non officials, who were already distrustful of British aristocrats sent to rule India. They were seen as out of touch with the "real India" and, secure in their position, ready to cross racial boundaries. The Ilbert Bill, named after Ripon's legal adviser Sir Courtenay Ilbert, was a natural consequence of encouraging Indian education. In the quarter-century since the Rising many Indians had trained in the law and been appointed as native magistrates. Now some were senior enough to be promoted to higher positions - in 1874 Romesh Chandra Mitter had been appointed to the Calcutta High Court. But Indians were not allowed to sit in judgment over Europeans in criminal matters, and the Ilbert Bill was meant to allow them to do so. The British in India exploded at the idea. Edwin Hirschmann titled his book on the subject White Mutiny, and at times it seemed like this might really happen. At the forefront of the opposition to the bill were the "non-officials". They knew they were most likely to be affected by it, particularly planters in remote districts where European magistrates were scarce, and at the most basic level it went against every concept of racial distance. Opponents of the bill set out to create an organised resistance, leading to the formation of the provocatively titled European Defence Association in 1883. Using the new telegraph networks, they set about creating a pan-Indian movement, working with pro-British newspapers, raising money from British businessmen and using friends and colleagues now retired in the UK to lobby with the establishment at home. Very rapidly, the Association created unprecedented opposition to the bill, eventually forcing Ripon to compromise, for example, with amendments allowing jury trials for Europeans where they could dominate the juries. The success of the anti-Ilbert movement crystallised an openly racist approach to governing India, deeply antagonistic to educated Indians and strongly supportive of repressive measures at any sign of agitation. And this would soon create its own opposition. t depend on fair treatment from British interests, and it made them amenable to Indian alternatives. In 1885, as the closing stages of the Ilbert agitation were playing out, this appeared in the form of the Indian National Congress (INC). Indian activists like Surendranath Banerjea had been shocked at anti-Ilbert racism, but impressed at how the Association had organised across India, so effectively and in such short time. The INC now set up to defend Indian interests in the same way, and it received crucial support from British officials, like AO Hume, who had been strong supporters of Ripon's reforms. After their success with the Ilbert Bill agitation, the Association lost momentum. It would later drop 'Defence' from its name, perhaps to appear less obviously antagonistic to Indians. During the Great War it had to deal with awkward questions about German members and, perhaps to compensate, became strongly focused on social work. But its conservative, racist heart remained and started raising its head as the British government started considering sharing powers with Indians. Jallianwala brought it all into focus. The Association instinctively identified with Dyer, even members didn't know how closely his roots entwined with their own. His racism, hatred of educated Indians and belief in the need to teach Indians a lesson were all their views, and it came out in the petition in ToI. When the government ignored them, the Association continued to agitate for Dyer, creating a memorial address for him and lamenting his poor treatment. But in truth their moment had passed and Jallianwala just confirmed it. The Association was too out of touch with British political opinion -they detested the growing Labour Party - and were increasingly simply ignored by both their erstwhile emulators in the INC and by British officials. Dyer was an appropriate hero for them, his complicated personal history and the warped views it resulted in, mirroring their own shortcomings. The only difference was that he actually acted out what they only talked about, and as such he is remembered, if only in horror, when the European Association of India is now entirely forgotten.